^ Emilio Aguinaldo. Presidential Museum and Library. ^ First Philippine President Emilio F. Aguinaldo 47th Death Anniversary. Manila Bulletin Publishing Corporation. February 5, 2011. ^ 3.0 3.1 3.2 Guevara, Sulpicio, ed. (1972) . The laws of the first Philippine Republic (the laws of Malolos) 1898–1899. English translation by Sulpicio Guevara. Manila: National Historical Commission. ISBN 9715380557. OCLC 715140. ^ DYAL, Donald H; CARPENTER, Brian B & THOMAS, Mark A (1996). [extract Historical Dictionary of the Spanish American War] (Digital library). Greenwood Publishing Group. ISBN 978-0-313-28852-4. ^ FREDRIKSEN, John C (2001). America's military adversaries: from colonial times to the present. ABC-CLIO. ISBN 978-1-57607-603-3. ^ Gen. Emilio Aguinaldo (1869–1964). aboutph.com. [2013-11-16]. （原始内容存档于2010-05-10）. ^ SCHRODER, William (2004). Cousins of Color. Twenty First Century Publishers Ltd. ISBN 978-1-904433-13-2. ^ WEIR, Frasier. Spanish-American War / War of Philippine Independence 1898–1901. University of Alberta. ^ 13.0 13.1 13.2 GUERRERO, Milagros; SCHUMACHER SJ, John (1998). DALISAY, Jose Y, ed. Kasaysayan: The Story of the Filipino People. 5 Reform and Revolution. Project Director: Teresa Maria CUSTODIO. Manila / Pleasantville NY: Asia Publishing Company, Limited (Reader's Digest). ISBN 9622582281. OCLC 39734321. "Contents: Vol 1 The Philippine Archipelago; Vol 2 The earliest Filipinos; Vol 3 The Spanish conquest; Vol 4 Life in the colony; Vol 5 Reform and revolution; Vol 6 Under stars and stripes; Vol 7 The Japanese occupation; Vol 8 Up from the ashes; Vol 9 A nation reborn; Vol 10 A timeline of Philippine history." ^ 14.0 14.1 KALAW, Maximo Manguiat (1926). The Development of Philippine Politics, 1872–1920. Manila: Oriental Commercial Co. OCLC 723615963. ^ 15.0 15.1 15.2 15.3 15.4 15.5 15.6 15.7 15.8 DELMENDO, Sharon (2004). The star-entangled banner: one hundred years of America in the Philippines. University of the Philippines Press. p. [10 ]. ISBN 978-971-542-484-4. ^ 17.0 17.1 HALSTEAD, Murat. XII. The American Army in Manila. General Emilio Aguinaldo, a traitor of the Philippine Republic, during Spanish-American Regime.. The Story of the Philippines and Our New Possessions, Including the Ladrones, Hawaii, Cuba and Porto Rico (Project Gutenberg). 1898. ^ Agoncillo,, Teodor A. History of the Filipino people [8th ed.]. Quezon City: Garotech. 1990: 157. ISBN 978-9718711064. ^ OOI, Keat Gin, ed. (2004). Southeast Asia: a historical encyclopedia, from Angkor Wat to East Timor (3 vols). Santa Barbara: ABC-CLIO. ISBN 978-1576077702. OCLC 646857823. 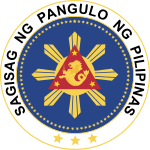 ^ Diosdado Macapagal, Proclamation No. 28 Declaring June 12 as Philippine Independence Day, Philippine History Group of Los Angeles, [11 November 2009], （原始内容存档于2009-05-12） . ^ 25.0 25.1 Quezon, Manuel L. III. History of the Philippines Flag. Flags of the World. 2 April 2002 [6 June 2007]. （原始内容存档于2008-02-05）. ^ Diosdado Macapagal, Chapter 4. June 12 as Independence Day, KALAYAAN (PDF), Philippine Information Agency: 12–15, 2002, （原始内容 (PDF)存档于2006-03-03） . ^ KARNOW, Stanley. 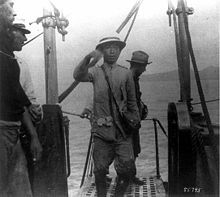 "Emilio Aguinaldo". In Our Image: America's Empire in the Philippines. Random House (1989). ISBN 978-0-394-54975-0. ^ SCHRODER, William. Cousins of Color. Twenty First Century Publishers Ltd. 2004. ISBN 978-1-904433-13-2. Agoncillo, Teodoro C. History of the Filipino People 8th. Quezon City: Garotech Publishing. 1990 . ISBN 971-8711-06-6. Agoncillo, Teodoro C. The Revolt of the Masses: the story of Bonifacio and the Katipunan. Quezon City: University of the Philippines Press. 1956. Artigas y Cuerva, Manuel. Andres Bonifacio y el Katipunan. La Vanguardia (Manila). 1911. Borromeo-Buehler, Soledad Masangkay. The Cry of Balintawak: a contrived controversy. Ateneo de Manila University Press. 1998. ISBN 978-971-550-278-8. Cruz, Hermenegildo. Tamiko I. Camacho, Jerome Espinosa Baladad and PG Distributed Proofreaders, 编. Kartilyang Makabayan: Mga Tanong at Sagot Ukol Kay Andrés Bonifacio at sa KKK Internet, Project Gutenberg. Manila: Guillermo Masangkay, Alvarado St., Brgy. 535, Manila. November 16, 1922 （Tagalog）. 引文格式1维护：未识别语文类型 (link) The reference is an e-book reproduction from Project Gutenberg. Diwa, Ladislao. Andres Bonifacio y el Katipunan. La Opinión (Manila). December 24, 1926. Fernandez, Leandro H. Autobiography of Gregoria de Jesus. Philippine Magazine (Manila). 1930. Reynaldo, Ileto. Filipinos and their revolution: event, discourse, and historiography. Ateneo de Manila University Press. 1998. Guerrero, Milagros C. Balintawak: The Cry for a Nationwide Revolution. Sulyap Kultura (Manila: National Commission for Culture and the Arts). 1996. Jesus-Nakpil, Gregoria. Mga Tala ng Aking Buhay at mga Ulat ng Katipunan. published by Jose P. Santos. 1932. Kalaw, Teodoro M. The Philippine Revolution. Manila: Manila Book Store Company. 1925. Reyes, Isabelo de los. La Sensacional memoria sobre la revolución filipina. Madrid: Tip. lit. de J. Corrales. 1899 （西班牙语）. Retana, Wenceslao E. Archivo del biblio filipino. Madrid. 1897. Ricarte, Artemio. The Hispano-Philippine Revolution. Yokohama. 1926. This book was published by Ricarte himself, includes his memoirs on the Philippine Revolution. St. Clair, Francis. Kataastaasang Kagalanggalangang Katipunan Nang Manga Anac Nang Bayan. Manila. 1902. （原始内容存档于2009-01-02）. Sagmit, Rosario S.; Sagmit-Mendosa, Lourdes. The Filipino Moving Onward 5 2007. Rex Bookstore, Inc. 2007. ISBN 978-971-23-4154-0. .
Santos, Epifanio de los. The Trial of Rizal. Horacio de la Costa, S.J. Quezon City: Ateneo de Manila University Press. 1961. Woods, Damon L. The Philippines: a global studies handbook. ABC-CLIO. 2006 . ISBN 1-85109-675-2. Zaide, Gregorio F. Philippine History and Government. National Bookstore Printing Press. 1984. Zaide, Gregorio F. Philippine Political and Cultural History: the Philippines Since the British Invasion II 1957 Revised. Manila: McCullough Printing Company. 1957. Zaide, Gregorio. The Women of the Katipunan. Philippines Free Press (Manila). November 26, 1932. Zaide, Gregorio. History of the Katipunan. Loyal Press (Manila). 1939. Zaide, Gregorio F. Documentary History of the Katipunan Discovery. Manila. 1931. Zaide, Gregorio. The Rise and Fall of the Katipunan Press. The Sunday Tribune Magazine (Manila). October 25, 1930.